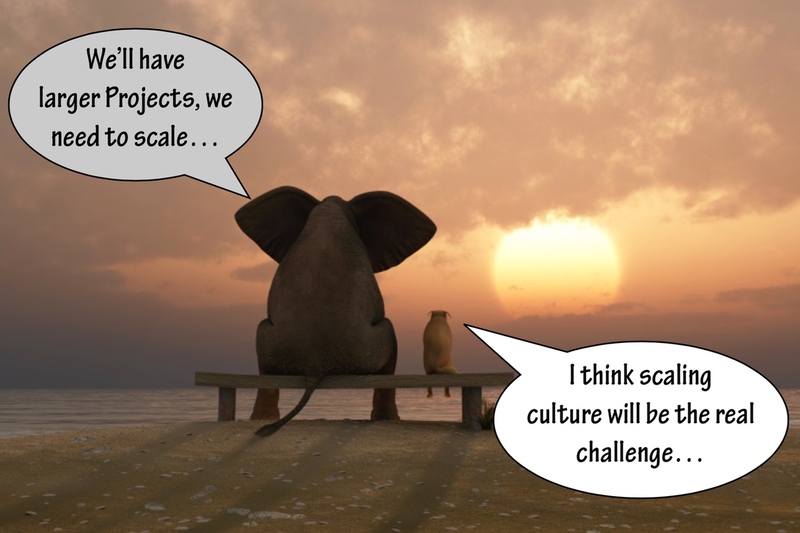 Stop scaling… Start growing an agile organization! Watch the session video on YouTube. If you are unhappy with the sound quality you can try the presentation given at Manage Agile 2016 that covers the same material. Asking the question triggers the most diverse answers. It nearly seems people don’t know what they want to scale, they just know then “need” to… it feels like someone presented scaling as the ultimate solution to solve every problem… and now everybody wants to buy it, it really feels like an old story. Way to often the focus about scaling agile lands on the delivery of projects, and explicitly on the operational model behind that. Every true Agilist would know that agility is about continuous improvement and excellence as much as it is about delivery of value. The real challenge lays in how to make an organization learn continuous improvement and embed it into its own culture. Pressure to deliver faster causes quality issues and delay, over-budget and stress. The old system of work and control does not seem to work BUT… as we only know that one, we keep on trying reorganizing every 9-12 months and still end up puzzled at how ineffective that turns out to be. It feels like we are running in circles incapable of finding a way out… until… Someone decides to try an agile approach to work, as last resort, somehow as desperate attempt to solve a non well understood problem. Guess what, most of the time the Pilot Project succeeds! And you know why? Because the people who wanted to try it out in the first place, are also those who would do anything to make it succeed… so is that really a Pilot? Does one “probe” clear the way to a whole company roll-out? The thing is that “agile” very likely didn’t do the trick, what probably did do the trick, is the fact that for the first time in the corporate culture, real teams have been formed, which have been allowed to self-organize. All of a sudden, as a side effect, we got all brain power functioning again! And when motivation is high, with the help of transparency, trust is developed, and accountability and commitment will drive the team towards meaningful results. But can you really copy and paste what that team did to the whole organization? Mistakenly many people end up exactly doing that, coping the practices and the tools, and try to adopt it in the next project. Remember what it is hard to achieve? That cultural shift? Well that means that people are becoming agile and not adopting agile tools and practices, that is what we call long lasting and sustainable organizational agility! How can we bring these behaviours at an organizational level though? What would we need to make that a successful journey? Dave Snowden, the creator of the Cynefin Framework, taught us then when we find ourselves in a complex domain, we need to experiment our way through it, by running small and safe-to-fail probes. This would allow to identify patterns that lead to success and failure, ultimately driving toward an emergent, self learning organization. There is no best practice, and no good practice in a complex domain! Besides what Snowden emphasizes is that the Cynefin Framework is a Sense Making framework and not a categorization framework. There are in fact 5 dimensions and those dimensions are determined by the data, meaning that are pretty much context dependent. So first comes the data, and than these data are analyzed to find a meaning, by confronting them with the context in which they have been produced, to establish in which domain they belong. Looking at the way results are produced in a specific context it is possible to identify the patterns that lead to the results, helping qualifying the appropriate domains. Organizations are containers for processes, structures, people, capabilities, technologies and products, and the way all these elements interacts with one another. It is common that depending on the context the interaction will be following patterns typical of the complex domain or of the complicated domain. We do have the tendency though, to exemplify the reality, and making it look a linear and easy to understand sequence of cause and effect relationships. From William Schneider we learn about the 4 possible types of core culture, which can exists within an organization. Only one culture will be the primary one even if will coexist with some of the others. Those won’t be any combination possible, because we also know that the ones on opposite quadrants are incompatible with one another. Some organizations believe that success - thus the culture that they propagate reflect this - is strongly rooted on control. These organization are valuing the system of work over the individuals, which in some extreme cases are disposable (ever heard the term Full Time Equivalent FTE? A very personal way of addressing people indeed). The strong focus on control, brings the organization culture to value rules, predictability, procedures, policies, gate checks, quality metrics, KPIs of any kind to reinforce the feeling of control. In some contexts this works quite well, particularly when we are producing goods in a mechanical and repeatable way. There organizations are also very focused on the present, nearly real-time measurement. Other organizations believe that success is strongly rooted on competence, meaning that by excelling at what they do, and beating the competition is the way to succeed. These organizations strives to develop very vertical and specific market segments, in which they can excel by selling expertise related product and services. Even if these depend on people, the whole competence building is a machine to produce repeatable and reusable capabilities. Standardization and high quality are keys, and development towards the future is a natural attitude, as a consequence of the understanding of the time required to build competence. On the left side of the diagram we find more “people friendly” cultures, which in the present tend to develop a culture rooted on collaboration, and looking at the future on cultivation. The latter is about enabling talents to grow, and nurturing innovation, trusting that the collaboration between people will both provide the drive and the commitment to achieve these. Coming from the 19th century, most of the companies have been organized using a hierarchical system, with a push approach to work - from top to bottom - and defined process control, defining clear processes, instantiating workflows, creating plans, and tracking times and intermediate artefacts. While this approach worked well through the 20th century in which the problem to solve was producing enough to meet the market demand, and increase profitability by reducing cost of labours, surely falls short in our century. In the 21st century, everybody talks about being innovative, and what the markets demand today, is evermore to have exactly what is needed, and to have it yesterday! With this rapidly changing market condition, the approach that worked for years, simply can’t anymore cope with the time to market expectations, with the competitive pressure, and with the need to innovate, which requires experimentation. Shifting toward an more agile and lean type culture seems to be a good way to initiate that journey, and reshape the organization to be more reactive, innovative and customer focused. agile42 Learned over 10 years of service to many customers, how to leverage this knowledge effectively, and created the Enterprise Transition Framework™ (ETF) to support organizations on that journey toward becoming a more agile, self-learning and innovating organization… Being a framework based on principles and emerging patterns, it adapts in terms of practices to organizations of any size, at least we think so… and we have good cases of organization with 60+ people up to organizations with some thousands to back up these claims. Naturally if you would try to compare any of these organizations on a practices and tools level, you won’t find many similarities, on the contrary, you will see how each of those, has grown their own agile way. So to contradict a well know slogan we could answer the question: “Does one size fits all?” with “No, not in practice… but in principles!”. Focus on small incremental changes: whenever changing from one way of working to another, we will go through a hybrid situation where the coexistence of two different ways generates attrition, duplications and other forms of waste. The awareness of this fact should push us in delivering changes fast and in small increments… pretty much like agile teams deliver changes, and evolve their own process by continuously learning what works and what doesn’t. Focus on value and organize accordingly: focusing on value means to make sure that there are as few obstacles as possible in the direction of the value streams. This implies that when we are setting up an organization to deliver a specific value on a value stream, we need to make sure that in that direction there will be the lowest possible number of flow discontinuity (such as handovers) and waiting time. It turns out that a good way to focus on the value is to use Lean Opportunity Canvas to create enough business and customer context to be able to determine the scope of a solution. Again following the approach of the Cynefin framework, the opportunity will be worked by teams, and will allow to identify over time, which are the most valuable streams on which to invest. Learning which features are delivering the highest value, and under which circumstances that did happen, provides a great way of codifying new patterns. Decentralize control whenever possible: decentralization of control and decision making, reduces the feedback loops, and enables faster reaction times. It requires defining goals and constraints to allow for autonomous decision making. Creating containers for self-organization is a way of determining which responsibilities and power to delegate to that containers. Through transparency the organization will learn to adapt those containers to support the most effective way of working. Avoid synchronization of flows unless necessary: De-synchronization is unintuitive, but allows for parallel distributed work, without having to carry the excessive burden of coordination and handovers. Way to often organization are aspiring at synchronizing all activities as if they were all gears of a clockwork. Unfortunately we all to well know that in many contexts the level of uncertainty is such, that is not possible to manage such synchronization without incurring in unjustifiable costs. Focus on delivering smaller valuable increments, rather than exercising in creating large packages to make multiple clients happy with one single shot. The reason is that to deliver the large package will take longer time, and for some of the features contained in it, the time to market might be already passed by. Besides working in large batches also causes peak in budget management, instead working with smaller increments generates a more regular cashflow, making the investments and profit more predictable. As we have learned from many of our customers, there are recognizable repeatable patterns that emerge when the principles we have shortly explained are followed. What we have also learned is that very few of the practices and tools end up being transportable from one case to the next without adaptation. There is a very low reusability factor in those things. Besides, if we shift the attention towards tools and practices, we risk to fail to shift the culture of our organization to the place where we want it to be. This will probably result in a short lived, and very dogmatic adoption of agile practices, models and tools, instead of a long lasting and sustainable self grown agile transformation. I am happy to speak at the Scan Agile in November in Finland about agile Agile Frameworks and more. 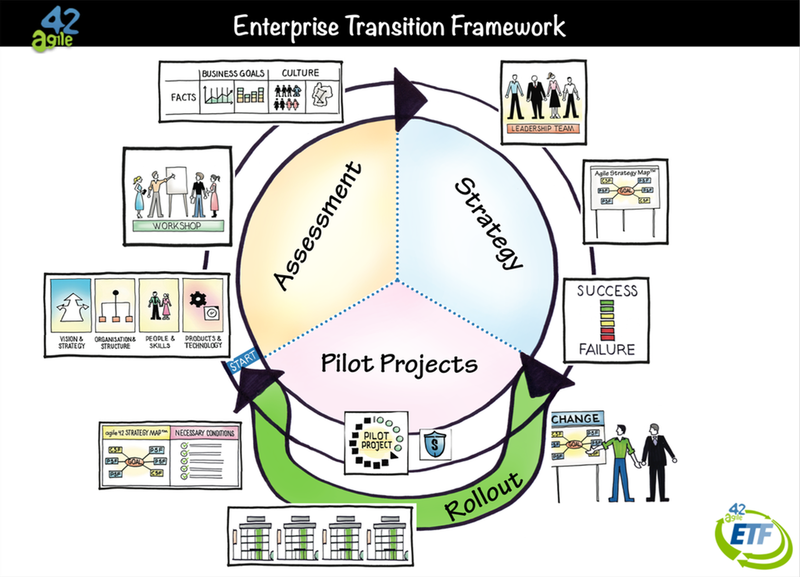 How does agile42 Enterprise Transition Framework™ compare with other large size Agile approaches like SAFe or DAD?